aaronwilson.org: Give That Girl A Raise! Give That Girl A Raise! Often when I've been by myself, without my wife, trying to load my three children (5, 3 & 18mos - and now a newborn!) into our van, I've joked to others that I'm going to double my wife's salary. "Man-oh-man is this a hard job!" 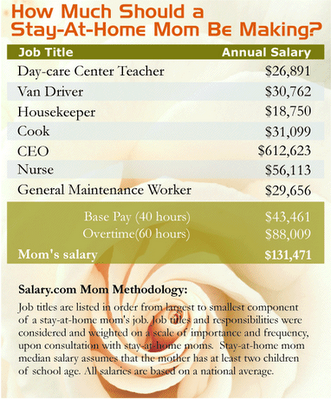 "She's worth much more than she's getting"
The catch is - she's a full-time, stay-at-home mom. Her salary: $0.00. Get it? Double her salary...double of nothing is...oh, nevermind. I learned real quick the correct answer to the question: "Does your wife work?" (What they mean is, does she work outside the home). My answer used to be "No." Correct answer: "Yes, she works, 24 hours a day, 365 days a year, no vacation, no sick time, no pay. Yeah...she works." So, mommies-to-be, talk it over with your significant other, quit that day job, grab the kids...and dream on! Amazing, huh? Now check this out - you can go here and print a "check" for your kids to present to their mom IF they could pay her what she's worth. And even if I could pay her that much...she wouldn't take it. The joys & blessings of raising our children in the "fear and admonition of the Lord" are, to her, worth far more than money. I'm so glad you posted this. Only 11 weeks into being a stay-at-home mom and so many people have asked the question "Are you going to stay at home or work?". It's really unnerving to think that people don't realize just how much work I do - alot of those very people being church members. I've even been told that I shouldn't stay at home since I went to school 7 years and have 2 degrees. It's as if people think money is more important than raising their own children. It's truly sad. Thanks again. It's nice to hear a male value stay-at-home moms.